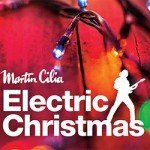 Electric Christmas – The Instrumental Surf Rock Christmas album by Australia's King of the Surf Guitar, Martin Cilia. Martin has channeled Duane Allman, Chuck Berry, Brian May, Harry Belafonte and the Marlborough Man. Sounds great.